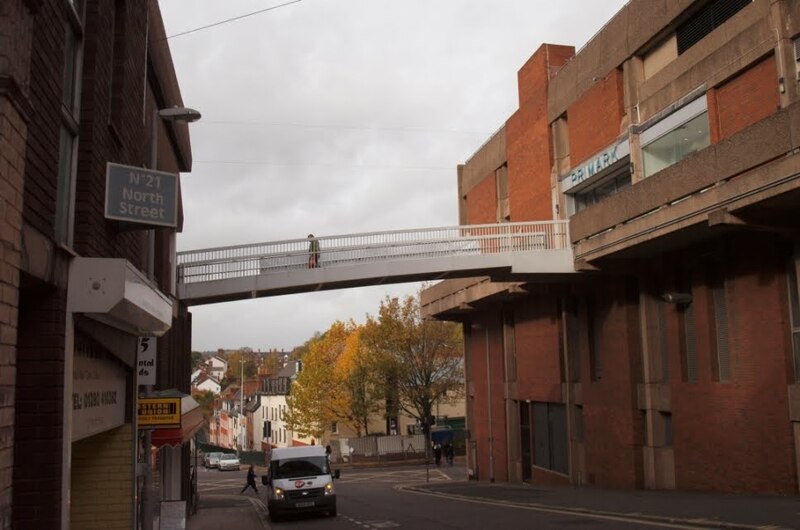 Until the early 1970s North Street was the location of two of Exeter's most important medieval domestic houses, both frequently cited by architectural historians in various periodicals and academic papers. One was No. 38, North Street. The other was No. 36, North Street. Both houses shared a similar layout and were of a similar age. Both still retained significant remains of their late-15th century origins, including their arch-braced hall roofs, and both were demolished by the city council to build the Guildhall Shopping Centre. Stretching back from North Street by approximately 140ft, No. 36 had been added to and altered throughout its nearly 500-year existence but the medieval plan and much of the early fabric remained intact. Like most of Exeter's medieval domestic housing, it was built on a long but narrow strip of land called a burgage plot. The original accommodation probably consisted of a shop, a solar, an open hall, a parlour, a large (bed) chamber, a kitchen and another chamber, and the arrangement of these rooms within the house was of great interest. The shop with the solar above were built as a single, two-storey block fronting onto North Street. Immediately behind this, and at right angles to the street in order to squeeze it onto the narrow plot, was the hall, open to the roof. Behind this was another two-storey block containing the parlour with a large chamber above. Behind that was a courtyard and behind that was yet another block containing the kitchen with a further room above. Running underneath most of the medieval property was a cellar lined with the red Heavitree breccia used so frequently in Exeter. A through-passage ran down the entire south side of the building giving entry into all of the ground floor rooms and linking the entrance from North Street with the courtyard at the back. The first-floor chamber above the parlour was linked with the chamber above the kitchen via a gallery that sailed out across the courtyard. All of the exterior side walls were built of Heavitree stone and the others were timber-framed. According to Portman, this unusual plan is "repeated, with minor differences, in only one other surviving house in the city, No. 38 North Street". Whoever built the house in the late-15th century was a citizen, probably a merchant, of significant wealth. Inevitable changes had taken place. The ground floor had been lowered by about 2ft. At the same time the timber-framed facade had been replaced and brought forward by 2ft. According to Portman it was still possible to see traces in the north wall of the jettied first floor as it oversailed North Street. The once open hall had also been divided into two rooms by the insertion of a floor. The kitchen block had been extended c1600 with the addition of two rooms behind it, and in the 1750s yet more accommodation was added behind the kitchen with the construction of another two-storey block containing a drawing room. 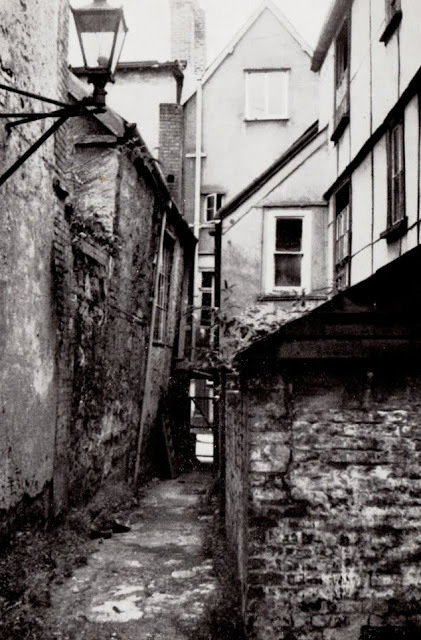 The photograph at the top of this post © University of Exeter shows the view towards North Street from a narrow alleyway that ran along the north wall between No. 36 and No. 35. To the right is the gabled end of No. 35, built in the latter-half of the 16th century, with a timber-framed extension at the rear. (No. 35 was demolished at the same time as No. 36.) To the left is No. 36, its open hall, and the window from which it was lit, clearly visible. The map right shows the position and extent of No. 36 c1900. So what exactly remained of the medieval building at the time of its demolition. The side walls were all intact. The through-passage also remained as well as the cellar. Three chimney-stacks still stood in the north wall. There was a huge, 6ft-wide fireplace from the open hall with a corbelled hood made from purple volcanic trap and moulded jambs with a similar, smaller fireplace in the parlour. A "great splayed window" in the north wall also survived from the hall with smaller windows that once probably lit the staircase. Only part of another fireplace remained in the first-floor solar but, writes Portman, "the one in the principal chamber is well preserved". Also preserved was a section of the wood and plaster partition between the parlour and the hall. Most of the timber-frame and stone walling of the kitchen block also remained, both from the 1400s and the 1500s along with another large fireplace. The first-floor of the kitchen block contained more wood and plaster partitioning as well as its simple late-medieval roof. Panelling and a carved chimney-piece remained in the mid-18th century drawing room. There is little else to add that hasn't already been said in previous posts regarding North Street. Even in the early 1960s No. 36 was empty and in a "dilapidated condition". Despite the rarity of their medieval layout and their importance to Exeter's by then greatly-diminished stock of historically important buildings, No. 36 along with its near twin at No. 38 were both demolished in the early 1970s to build the visually atrocious Guildhall Shopping Centre. It seems incredible that two almost adjacent medieval open halls with intact arch-braced roofs should've simply been torn down as late as the 1970s. No. 36 stood to the right, near the footbridge, in the photograph below. Very interesting. 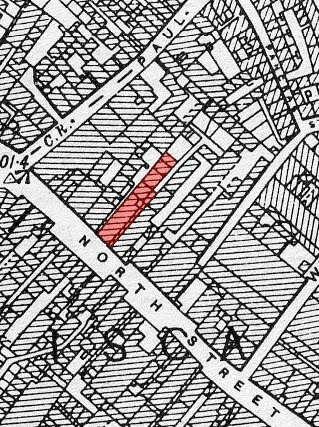 My grandfather gave the shop at 36 North Street in 1917 as his address when enlisting in WW1 and from what I was told it was a butcher's/provision merchant even though a letter on the WD file requesting his early release is from someone who is listed in Kelly's 1902 as a Fishing Rod and Tackle Manufacturer! Obviously changed use in that time though I suspect it was not in use for residential purposes by WW1.